It’s amazing how even when you think you have no life, that non-life can totally eat up your time for the REALLY DAMN IMPORTANT stuff, like running Shrouds or… posting on your MyDDO blog. So while my computer is busy updating video drivers (why do downloads take so long with Chrome? Should’ve used IE or FF), I got to thinking about how much I liked reading Mizzaroo‘s post titled “A Proper Introduction,” which led me to think that I’d kind of like to make a post like that myself. Well, KIND OF like that; since Mizzaroo already introduced herself, I’m not going to introduce her again. No, this time you’re stuck meeting – me. Part of this is kind of laziness because I have SO many blog ideas rolling around in my head and I can’t decide which to tackle first, and none of them are likely to be any time soon because NaNoWriMo (National Novel Writing Month) begins one week from today and dammitall, THIS year I’m really going to do it! Writing 50,000 or more words in one month is probably going to seriously cut into my blogging time and *sniffle* possibly cut down on my playing time as well. But anyway, that doesn’t tell you much about me. Not that there’s much to tell. I’m really female, I have brown (not green :P) hair, and I’m probably older than you (just turned 29 for the *mumble*th time). I am currently single and most days quite happy to stay that way. I have two cats, both rescues. Victoria was a “needs extra TLC” hardcase who discovered people food and became an outgoing social butterfly. Wave a packet of tuna at her and she’ll follow you anywhere. She is INCREDIBLY smart. I’ve had cats all my life – always had at least one, usually more, since I was about four – and she’s got more brains than any of them. Then there’s Callie, who is a former feral considered unadoptable because she was so wild; in fact, when I tried to adopt her, the shelter wouldn’t let me. They made me sign a foster contract in which I had to agree to keep her in a cage – she was really THAT wild. They just wanted me to keep her for a few months until the weather warmed up so she could go to a feral colony. Well, contract or no, I don’t keep cats in cages. It took three months before I could even touch her at all, but now the scared, scrawny six-pound puff of fur I brought home is an 18-pound lump of cat who thinks my lap is her personal domain. Besides cats – and snakes – I’ve owned/been owned by dogs, a purebred Arabian gelding, various birds, iguanas, guinea pigs, gerbils, fish, scorpions, chickens, rabbits, mice, assorted large and small lizards, frogs, and probably a few others I can’t think of off the top of my head. Let’s see, when I’m not playing DDO or working (I’m a contract copy editor for a company that handles content for a number of websites, which means I correct a lot of spelling/grammar/punctuation mistakes, work at home – in my jammies if I want, have no benefits and make crappy money). I’m a total Harry Potter nerd. I like reading just about anything , listening to music and occasionally writing/playing some, drawing, photography and… COOKIES. Sports are a hobby of mine as well, as I spent about 10 years as a newspaper sports writer/editor. I’m definitely MUCH more of an observer than a participant. I love high school sports of all kinds; that’s the bulk of what I covered during my newspaper days, with occasional forays into Penn State football, Philadelphia Flyers hockey, college and minor league sports, stuff like that. I’m originally from the Philadelphia area and hockey was the first sport I got hooked on, so I LOVE my Flyers. And Phillies, and… well, I’m OK with the Sixers but not overly happy with the Eagles after their shoddy treatment of Donovan McNabb, who’s one of my favorite athletes (both for his character and his playing ability). I also have a weird habit of collecting nail polish, from “normal” colors to really weird ones. Give me glitter! Give me chrome finish! Give me fluorescence! I’ve been known to wear 20 different colors at once (one for each fingernail and toenail). Even has been greater reincarnated (THAT will be material for a whole ‘nuther post someday). Still pure pally but took Defender of Siberys, which I LOVE. 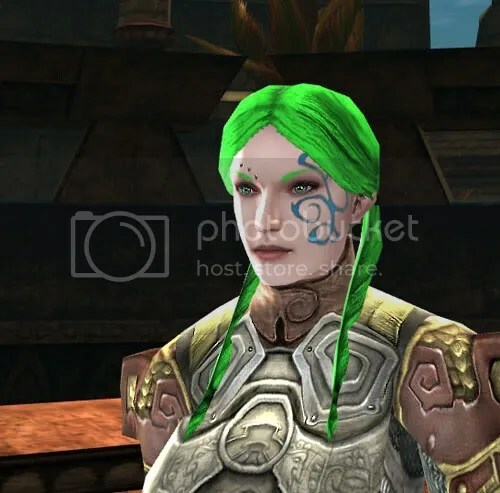 Still has the acid green pigtails but now has a much better complexion and no longer looks like an undead with a tan. 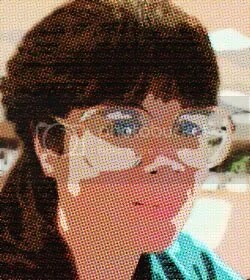 Jall has Tier II finished on her GS ConOp goggles but needs at least two of EVERY large ingredient for Tier III. I need to start getting her into some epics. She ran her first Hound of Xoriat recently and was the only healer in the group, which was a bit stressful but totally worth it when she opened the end chest and found Lorrik’s Necklace in there with her name on it. Acanthia is moving up fast – she’s up to lvl 15 and flagged for Shroud (still hasn’t run it yet though). She also has GS goggles, although I don’t have enough ings to put anything on them yet so they’re kind of sitting in her inventory doing nothing. She’s been soloing the Vale wilderness since lvl 12 and recently started on Reaver’s. Victaurya – poor Vic. She’s really not very solo-able and so while I LOVE to play her, she usually gets bypassed for Acanthia. Now that Acanthia’s moved by her by three levels and counting, I don’t have anyone else close to Vic’s level range, so maybe she’ll finally get some playing time. I need to get her to lvl 13 because she’s not half bad with her repeater, and the Wind Howler bracers sitting in her bank will make her even better. Dissy gets sporadic playtime but just levelled up to 9, and also got her second bank slot from House K, which she desperately needed (all my toons are cyber pack rats). Like Vic, she’s not very solo-able, but LRing her to Spellsinger instead of Warchanter was definitely the right move. She’s much more fun to play now. Merenwynne is lvl 5. She doesn’t get to play much but has some cool gear because she gets Acanthia’s hand-me-downs. Azida is almost to level 6, so she’ll be able to use her Muck’s Doom soon! She has a new Cannith buddy around her level to run with, and her other two buddies have new toons, so she should start getting some XP during Cannith Night every Friday now. All of my other toons are pretty much for favor farming and get playing time at random. I did take some time the past few days to log everybody on, get a couple snapshots of them (because one of these days I might make intro posts about each of THEM, just ’cause I might not have bored you enough with this one), and occasionally run a quest or two depending on my mood and what they needed. Er – I logged in ALMOST everybody, saving the Cannith toons for when I have some extra time because there are four of them and even though Azida is clearly my main there, they all have the potential to be more than favor farmers. So that’s me in a nutshell – HEY! Who put me in this nutshell? Let me out!